The Czech-Korean Society and the Korean Studies Dep. of the Charles University in Prague are organizing an international academic conference on Korean popular culture called Winning Central Europe: Spread and Reception of the Korean Wave in the Czech Republic and the Adjacent . Scholars from the fields of Korean Studies, Musicology, Media Studies and Cultural Studies have been invited to Prague on November 28-29, 2014 to reflect upon the increasing success of the Korean Wave (mainly K-Pop) in the Czech Republic and Central Europe. Coming from Austria, Germany, UK, Sweden, Romania, Poland, Hungary, and the Czech Republic, these distinguished guests will share their expertise and recent research projects in Hallyu studies with invited graduate students and practitioners. The conference is organized in cooperation with the Korean Studies Department of the Charles University in Prague. 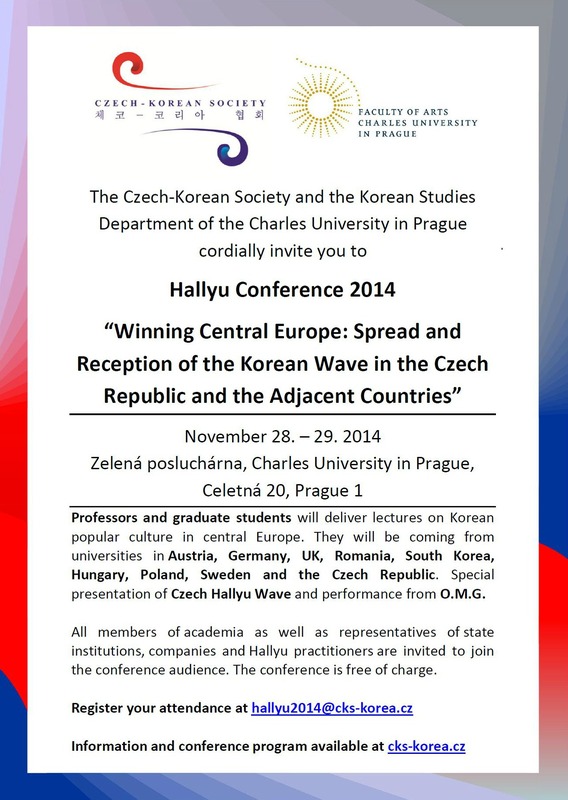 The Czech-Korean Society received support from the Academy of Korean Studies in Seoul to organize this conference. JOIN OUR CONFERENCE as a graduate student speaker or the audience. The CONFERENCE PROGRAM will soon be announced here.